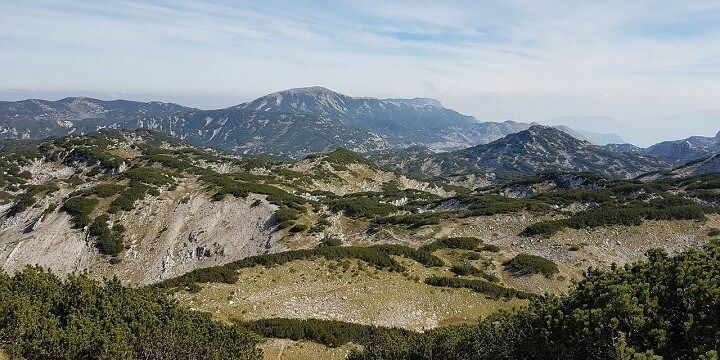 One of the great things about Bosnia and Herzegovina is its small size, meaning you can experience a huge range of culture, climates, and nature in just a few days. If possible, rent a car to easily get from one town to the next and explore the country’s hidden gems. Sarajevo offers a real insight into Bosnia and Herzegovina’s past. The Latin Bridge, for example, marks the point where the Archduke Franz Ferdinand was assassinated, sparking the outbreak of the First World War. You can also visit the Kovaci Memorial Cemetery, which commemorates those who lost their lives in the 1990s Civil War, and the City Hall, with gorgeous carvings, stained glass, and a fascinating exhibition about Bosnia’s history. 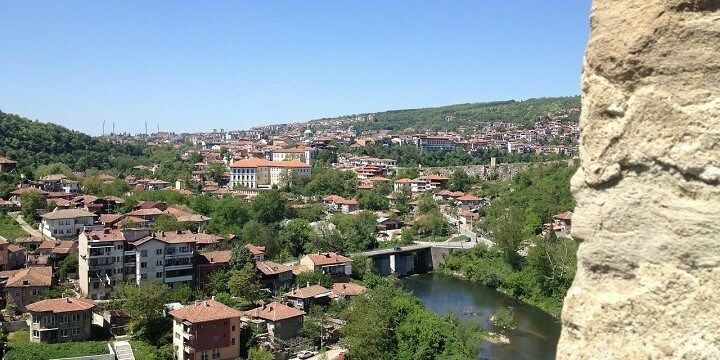 Don't miss out on the great view over Sarajevo. Be sure to take a stroll around the Bascasija district to experience a range of Eastern European and Turkish markets, restaurants, and coffee shops. Don’t miss out on tasty dishes like burek (baked pastry stuffed with meat, spinach, or cheese) and cevapi (grilled meat), which you can wash down with Turkish coffee. A short drive from Sarajevo will take you to the country’s mountainous regions. Drive just 20 minutes to the foot of Mount Trebevic, from where you can get a cable car to the 1,629-meter-high peak. Sarajevo is close to more mountainous regions. Alternatively, drive a little further to Mount Jahorina for Bosnia’s best winter sports. The small resort here offers great skiing, snowboarding, and snowshoeing facilities. More natural beauty can be found at Vrelo Bosne, a park just 30 minutes from Sarajevo. 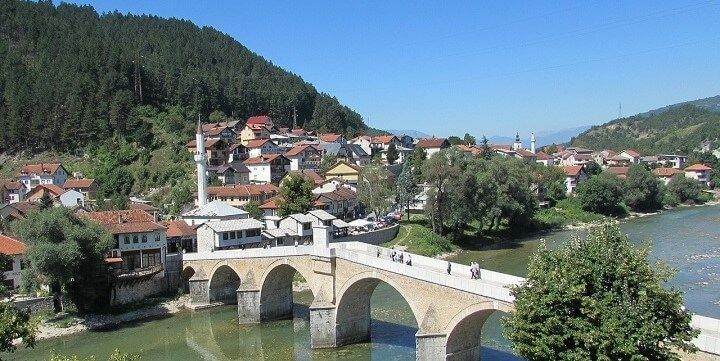 Stroll along the Bosna River, watch the fish and ducks, and cross the many intricate wooden bridges. Alternatively, head to the Skakavac Waterfall, where you can choose between three tough routes that lead to the tallest waterfall (98m) in the country. The Bijambare Caves, meanwhile, are just under an hour from the capital. The largest of the five caves, Bijambare, is 420-meters long and boasts four spectacular main halls. Don’t just stick to Sarajevo during your time in Bosnia and Herzegovina: there are plenty of smaller towns to explore, too! Konjic, for example, is just 90 minutes from Sarajevo. Its strategic location on the Neretva River makes it popular among whitewater rafters from all around the word. Its Old Town, meanwhile, is a trendy area for bars and cafés that offer a great view over the impressive Stone Bridge. The town of Konjic is located on the Neretva River. Mostar is located just one hour from Konjic. 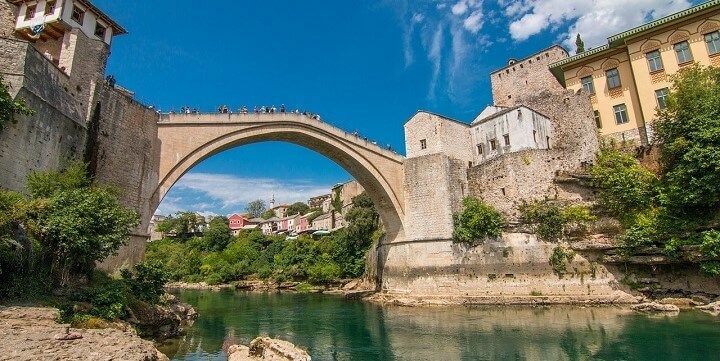 Its 16th-century Islamic bridge, Stari Most, is at the center of the town, and is popular among adrenaline junkies who take the 20-meter plummet into the water below. The Old Town, meanwhile, offers a huge range of traditional Ottoman markets, selling rugs, ceramics, cashmere scarfs, Turkish lamps, and more. The Stari Most Bridge is one of Mostar's most iconic landmarks. Bosnia and Herzegovina’s second-largest town is located in the North of the country. Banja Luka’s main sights include its huge Orthodox Church, the Cathedral of Christ the Savior, the beautiful Ferhadija Mosque, and the Kastel Old Fort, overlooking the Vrbas River. After exploring these cultural landmarks, head to the city square for great pubs, bars, and clubs, or check out the range of shops on Gospodska Street. 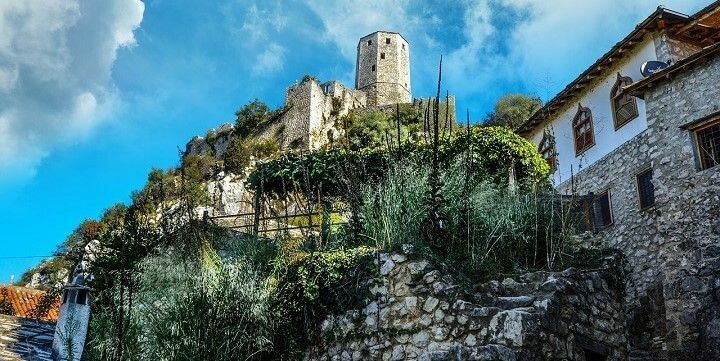 Southern Bosnia and Herzegovina has more quaint little towns to offer, including the UNESCO village of Pocitelj. Don’t leave without visiting the huge 16th-century Kula Fort, the village’s beautiful mosque, or strolling around its cobblestoned streets. The UNESCO village of Pocitelj is located in southern Bosnia and Herzegovina. Alternatively, check out the Catholic pilgrimage town of Medjugorje, where teens claim to have spoken with the Mother Mary. Even if you’re not religious, it’s worth visiting Medjugorje for the impressive Kravice Waterfalls, which fall down limestone rocks from the Trebizat River into the green lake below. Neum features the second-smallest coastline in the world. In the mood for sunbathing? 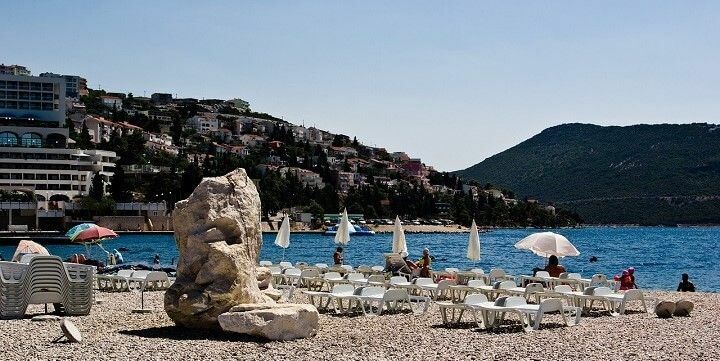 Check out Bosnia’s tiny, 20-kilometer long coastline in Neum, the second-smallest coastline in the world! Simply relax on the Adriatic beaches, take a boat out to the tiny islands, or enjoy delicious seafood in the beachfront restaurant. If NextStop24 helped you to choose your next travel destination, we'd be very grateful if you’d search for your accommodation and things to do in Bosnia and Herzegovina through these links. They're affiliate links, which means that we will receive a small commission for every booking made through them. There are no extra costs for you; you'll simply be helping to keep NextStop24 running. Thanks! Bosnia and Herzegovina is a wonderful country. It is recognizable by the beauty of nature, traditional food and friendly people. I recommend to all who are in the opportunity to visit Bosnia and Herzegovina. Sarajevo is in the center of Bosnia and Herzegovina, near mountains Bjelašnica, Igman, Trebević and Jahorina. The mountains and Vrelo Bosne (source of river Bosnia) are beautiful. If you love nature, don't miss to visit these places. People are very friendly and kind, always ready to help you. During the Sarajevo Film Festival the atmosphere in the city is fantastic. The architecture is a beautiful mix of east and west, it's a great combination of old and new, traditional and modern. Old town, Baščaršija, is really great place to find beautiful and amazing handmade souvenirs. The food is delicious, especially ćevapi at Ćevabdžinica Željo, in the center of Baščaršija.